MGM Files Lawsuit against Route 91 Concert Attendees and Demands Immunity Under the Federal SAFETY Act. MGM has filed a complaint for declaratory relief against hundreds of Route 91 attendees. The lawsuit asks a federal court judge to say that Route 91 shooting victims and survivors cannot sue MGM for personal injury in Nevada state court for what happened. The lawsuit seeks to preempt Route 91 shooting victims and survivors right to file lawsuits for personal injury in Nevada state court. The grounds of MGM's lawsuit are obscure, and we do not believe that the SAFETY Act applies to this case. The purpose of the SAFETY Act is to ensure that the threat of liability does not deter potential manufacturers or sellers of effective anti-terrorism technologies from developing and commercializing technologies that could save lives. The SAFETY Act has never been applied to MGM and cannot apply to to MGM because MGM security is not licensed under the SAFETY Act. Route 91 Plaintiffs are outraged by MGM's request for a declaration of immunity from their portion of the negligence giving rise to this horrible shooting. 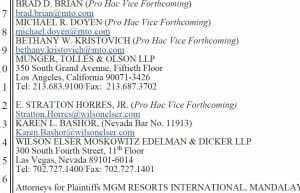 The timing of the lawsuits comes after lawyers uncover prior Gun incident at Mandalay Bay, and the timing of the MGM lawsuits is not so coincidentally retaliatory. The Napolin Law Firm will release more information as it becomes known. MGM is the largest employer in Nevada. Watch The Napolin Law Firm discuss MGM's obscure legal maneuver directed against Route 91 attendees. Alexander Napolin is a Personal Injury Lawyer in Claremont, California and serving the San Bernardino and Orange County surrounding areas. His cases focus on car accidents, workers' compensation, accident injuries, wrongful death, and personal injury cases.